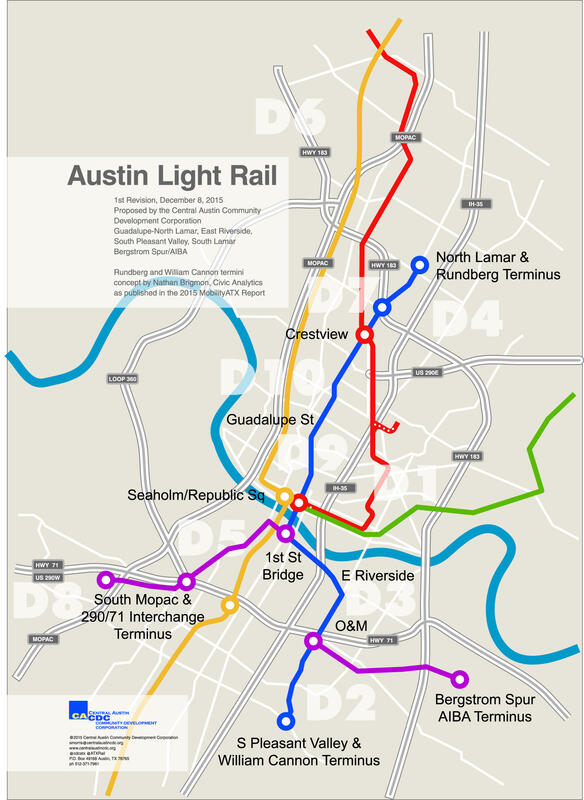 From the Austin Monitor: As City Council members careen toward their first chat with the public over a potentially massive mobility bond, a new proposal for light rail investment has risen up from the grassroots. On Thursday, the nonprofit Central Austin Community Development Corporation announced that it had shared with Council members its vision for a 5.3 mile, $397.5 million route that would connect Crestview Station on North Lamar Boulevard to Republic Square Park in downtown Austin. The proposed route would be the initial segment of a longer line that would eventually stretch from north of U.S. Highway 183 down to Pleasant Valley Road and William Cannon Boulevard, according to a map drawn up by the CACDC. The line largely parallels the Capital Metropolitan Transportation Authority’s three highest-ridership bus routes — the 1, the 803 and the 7 — which had a combined average of nearly 20,000 weekday boardings in spring 2015. CACDC, which says it based its plan on a “data-driven study” developed by the research firm Civic Analytics, predicts a daily ridership of 37,400 on its initial segment. That’s nearly 20,000 more boardings-per-day than was predicted for the light rail route packaged with road projects into a $1 billion bond that Austin voters resoundingly rejected in 2014. Clemens told the Monitor that as soon as that proposition lost, he and his fellow activists began working to get a fresh proposal before Austin voters in time for the next election. Unlike the 2014 proposal, whose $600 million worth of rail money was hoped to be matched by federal dollars, this new plan would move forward without outside help. Houston’s METRORail opened in 2004 with an average daily ridership of just over 12,000. The system has since grown its network and in April averaged nearly 60,000 boardings per day. The CACDC’s work on behalf of light rail, however, could be for naught thanks to inactivity on the part of one of the more important participants in local transportation policy: Capital Metro. “My understanding is that Capital Metro is not ready to start discussing light rail again,” Council Member Delia Garza, who also sits on the transit agency’s board of directors, told the Monitor on Thursday. She suggested that the conversation could be resumed later this year when Project Connect, the partnership between the city and Capital Metro that produced the 2014 proposal, renews its focus on central Austin later this year. Also working against the grassroots rail proposal is Council’s accelerated time frame to decide whether to hold a bond election at all. According to city staff, the typical bond development process takes up to 18 months. This time around, though, Council’s sudden interest at the beginning of the year cut that timeline in half. At Wednesday’s work session, Council members heard the formal presentation of the Mobility Talks survey, a rushed public outreach effort begun in March. That same meeting also featured several bond scenarios similar to a $720 million package floated by Adler a week before, which would fund a variety of road, transit, bicycle and sidewalk projects. Council’s Mobility Committee could potentially make a bond recommendation as early as its next meeting on June 14. Despite that quickly approaching decision deadline, and despite the lack of any acknowledgement of rail from the mayor, city staff or Capital Metro, Clemens told theMonitor that he’s hopeful the CACDC plan will get a fair shake. He noted that the Urban Transportation Commission and the Zoning and Platting Commission both this year endorsed light rail as a consideration for a November bond. From the Austin Monitor: Mayor Steve Adler has blasted into the middle of the ongoing conversation about a November mobility bond election by proposing an estimated $720 million package of projects along Austin’s most vital arterials. Earlier this year, Austinites got a warning from their mayor: Pass a proposed light rail line, or face certain doom. There was no "Plan B," voters were told. "Here's the basic equation," Mayor Lee Leffingwell said in his State of the City address, "Rail or fail." Austin voters chose the latter option this election, saying "No" to a billion-dollar light rail and road improvements proposal by a wide margin, 57 percent voting "No" and 43 percent voting "Yes." The proposal garnered a lot of interest, with 15,000 more Austinites voting on it than on the race for Mayor of Austin. Contrary to what you might have heard, this was technically the first time a rail plan has been voted down within city limits. So what happened? How did a supposedly progressive, typically bond-approving city electorate shoot down something so strongly? After years of false starts and changed plans for light rail in Austin, voters have decided against a billion-dollar plan that would have brought the city its first light rail line and hundreds of millions of dollars in road improvements.